Grind Stormer, known in Japan as V-V (ヴイ・ファイヴ, V-V?) 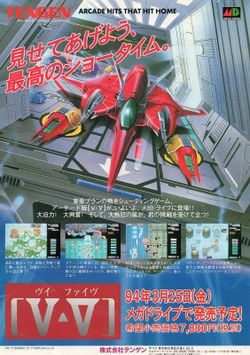 or V-Five, is a vertical scrolling shooter developed for the arcade by Toaplan, and ported to the Sega Mega Drive in 1994 by Tengen. It is considered a successor to Slap Fight as it uses a similar power-up system. The player assumes the role of an arcade player controlling the NA-00, a space fighter on an alien planet destroying every enemy in its path while amassing a score and surviving a merciless checkpoint system. The game takes place in the year 2210 where 'the ultimate arcade machine' Grind Stormer/V-V has finally been released. A VR shooting game, Grind Stormer/V-V becomes so addicting that the government assigns a young man to investigate the arcade phenomenon in order to question its true purpose and to perform the impossible: to beat the game. Japan Mega Drive cover art. This page was last edited on 3 June 2018, at 03:57.